We’ve seen outrageous posters and hilarious clips and today, Universal and Point Grey Pictures have unleashed the riotous red band trailer for comedy sequel, Neighbors 2: Sorority Rising. Welcoming back Seth Rogen and Rose Byrne as well-to-do parents Mac and Kelly Radner, Sorority Rising picks up at a time when the lovestruck couple are expecting a second child. Seeking pastures anew, the Radners tee up plans to move to a bigger home, but they’re forced to wait a further 90 days while the deal falls into place – although those three months will seem like an eternity thanks to Chloe Grace Moretz’s party-starter. Flanked by a group of sorority sisters, Moretz sets about turning the Kappas’ home into a party haven and in their desperation for some peace and quiet, Rogen and Byrne’s couple form an unlikely friendship with Zac Efron’s returning jock, Teddy. Nicholas Stoller is behind the lens, while Rogen is also part of the writing team, along with Rogen, Evan Goldberg, Andrew Jay Cohen and Brendan O’Brien. Lisa Kudrow and Billy Eichner around out the core cast list. 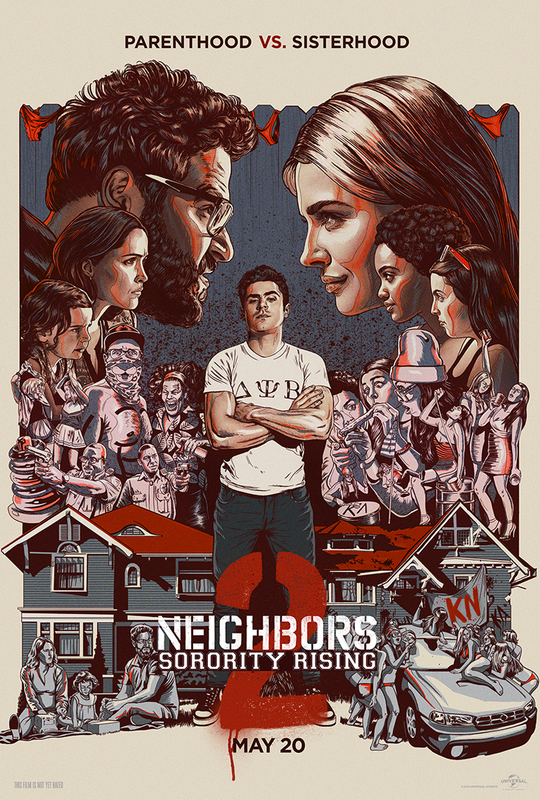 Neighbors 2: Sorority Rising will raise all hell when Universal and Point Grey Pictures launch the comedy sequel on May 20.